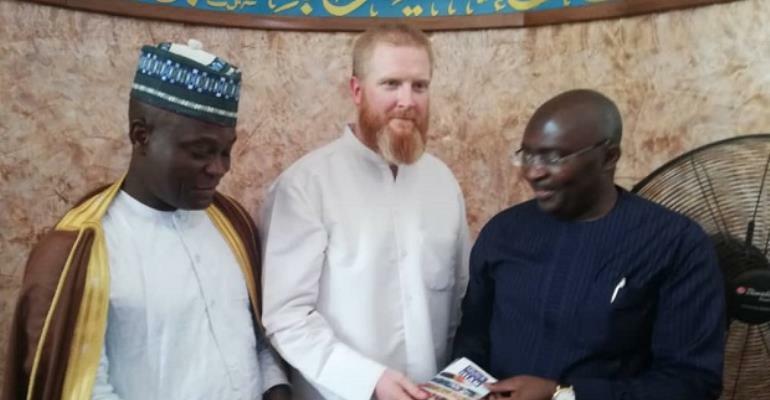 Vice-President Dr. Mahamudu Bawumia has supported the renovation of the Police Mosque at Cantonments in Accra with a cash donation of GH¢50,000. The gesture which took place last Friday was received by Sup/Imam Hussein – the cleric in charge of the facility where many Muslim diplomats say their Friday congregational prayers. Standing on the side of the Imam when the donation was being received was a visiting British Islamic cleric – John Fontaine. The visiting cleric had made a sermon which attracted a wonderful reception by the congregation who turned up for the Friday congregational prayers at the facility. Obviously fascinated by the people of this great country, the British cleric described Ghana as a blessed and peaceful country with a lovely people. He said Ghanaians should let the harmony that exists among them turn into positive developments that would benefit the country. He prayed for the President, the Vice-President and the country for good health, good governance and prosperity.